We’re rented an apartment on Beacon Street in Bay Bay, close to the trendy shopping areas of Boylston and Newberry streets. The swamp that used to occupy this neighborhood was filled in the late 19th century and renovated in the Haussmann style of Paris, wide tree lined avenues in a geometric grid pattern with five east to west streets; Beacon, Marlborough, Commonwealth, Newbury and Boylston, and eight north to south streets; Arlington, Berkeley, Clarendon, Dartmouth, Exeter, Fairfield, Gloucester and Hereford. Some say this is the most desired real estate of Boston. For us, it’s a great central location to explore the city. Boston is one of the best walking cities in America, especially in the Autumn. If we do get tired of walking the subway stop at Copley Square is a short walk from the apartment. The name Massachusetts comes from the Native American word “land of the blue hill”. The land used to belong to the Narragansett, the Mohican, the Mohawk, the Wanpanoag and Massachusett tribes (among others) but they were wiped out (sometimes conveniently) by the European settlers making way for the first Puritan settlement at Plymouth in 1620. The Puritans founded the city in 1630, but it’s real importance came during the years leading up to the American Revolution. In March, 1770, five unarmed protesters were killed by British Militia when shouts of protest turned into an airbourne assault of snowballs and rocks. A loaded Militia rifle (accidently?) went off and in the choas that followed five colonists lay dead and another six wounded. This was the spark that ignited the American Revolution. In 1773, after Sam Adams rousing sermon to nearly 8,000 protesters against “taxation without representation”, approximately 100 men left the South Meeting House, disguised themselves as Mohawk Indians, crept aboard three ships carrying tea from the East Indian Tea Company and threw 343 chest of tea into the Bay. The general consensus taught today is that these “Sons of Liberty”, as they were known, were protesting the Tea Tax. In reality thought, the Tea Act of 1773 actually lowered the tax on tea. Kind of like the Tea Party of today protesting against increased taxes, when the taxes were actually reduced. By 1774, the American Colonists were organizing their own Militia and preparing for a war against the most powerful nation in the world at that time. About 80% the people threw their support to the rebels (Whigs, Patriots) while the other 20% (Loyalists, Tories) stayed loyal to the British crown. I’m sure there was also a percentage that played both sides. The outcome might have produced American Independence but the war on how to govern this country is still going on. The euphoria of Independence didn’t last very long. From the start, the Jeffersonian “Republicans” wanted a less centralized government with more power to the States, while the Hamilton/Washington “Federalists” wanted a country governed by a strong central governing body a central bank, strong business and strong trade, especially with Britain. The Federalist gave way to the Democrats under Andy Jackson and there you have it. It’s strange though, these days both parties seem to favor big banks and big business. The best way to trace the Boston roots of the American Revolution here is taking the 2.5 mile “Freedom Trail” that meanders through the modern steel and glass of the city. Boston has done a really good job of mixing the modern with the old heritage city. 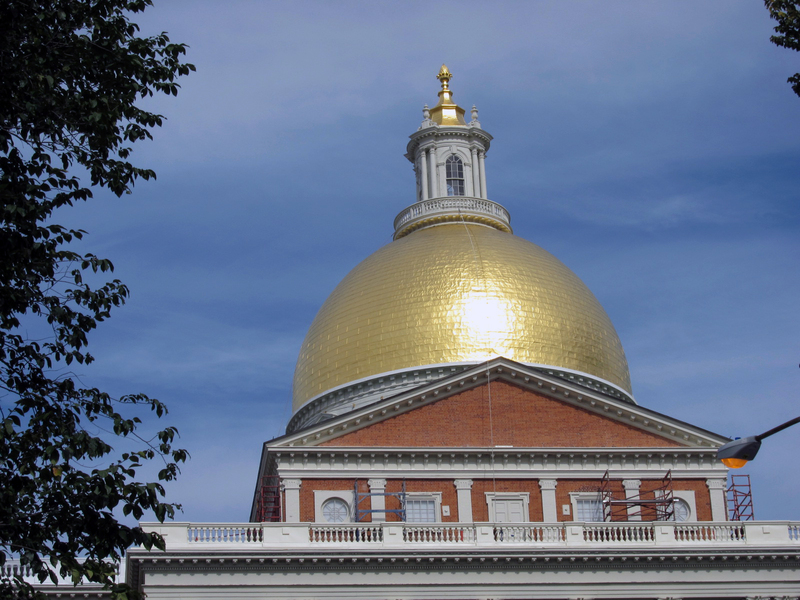 The tour starts in Boston Common near the Golden Domed 1798 State House. 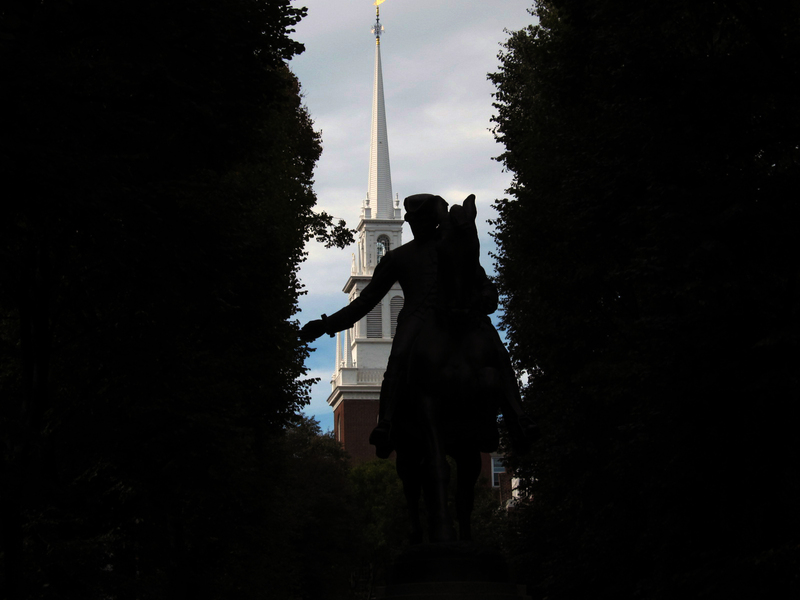 The original wooden dome was covered with copper by Paul Revere but it’s gone through many renovations since then. During World War II it was painted black for protection in case the city was bombed. It wasn’t. On past the State House is the Park Street Church where Oliver Wendell Holmes father was the pastor in the early 1800’s, and beyond the church is the Granery Burying Ground where by some accounts 8,000 colonial Americans are laid to rest, which is hard to imagine when you’re inside the grounds. It’s pretty small. 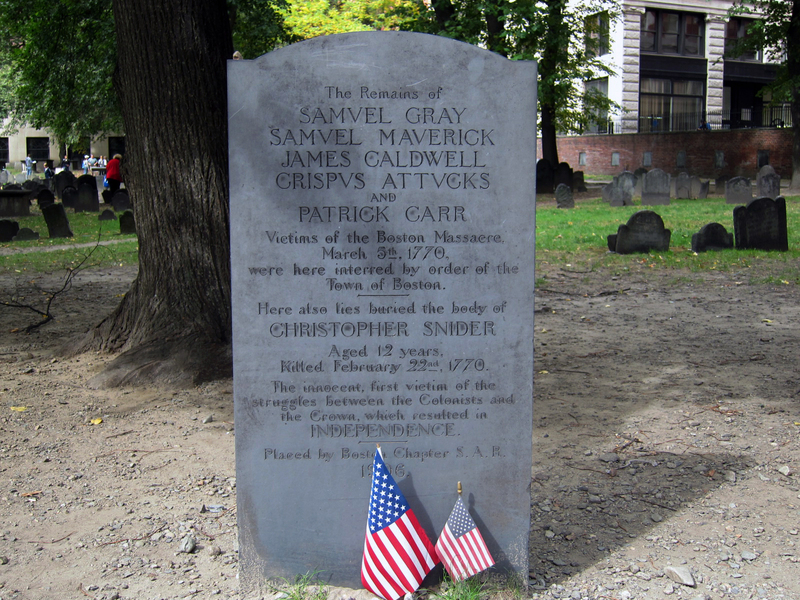 Some of the most famous here are Ben Franklin’s parents, John Hancock, Paul Revere, Sam Adams and the victims of the Boston Massacre. If you’re into cemeteries, there’s also the smaller, yet older, King’s Chapel Burying Ground where you can find John Winthrop, Massachusetts’ first Governor, Mary Chilton, the first woman to step off the Mayflower and William Dawes, the “other” rider who dispatched to Lexington and Concord with Paul Revere. Back on the trail is the old Corner bookstore, America’s leading publishing house between 1833 and 1864, publishing the works of Henry Wadsworth Longfellow, Harriet Beecher Stowe, Nathaniel Hawthorne, Ralph Waldo Emerson, John Greenleaf Whittier, Oliver Wendell Holmes Sr., Charles Dickens and Louisa May Alcott. Not a bad stable of writers. Down the street from the bookstore sits the Old South Meeting House, where on December 16th 1773, Sam Adams inspired the “Sons of Liberty” to dress up as Mohawk Indians and dump over 30 tons of taxable tea into Boston Harbor. 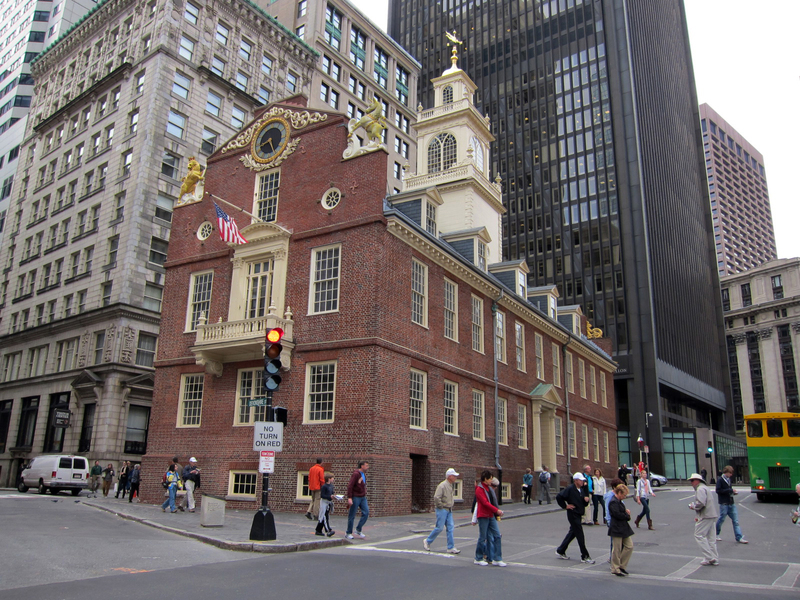 After passing the Old State House, the location of the Boston Massacre and a great little museum, you can walk down the street to Faneuil Hall, once the center of Boston Commerce in the mid 18th century and nowadays the heart of the tourist trade. Although it does get filled with clowns, jugglers, acrobats and souvenir vendors, there are a lot of tastey local food stands for a quick bite before heading out towards the North End. The North End of Boston is the oldest residential part of Boston, settled in 1630. Thes days it’s mostly known as Boston’s Little Italy. The area has been the magnet of immigration since the 17th century. It was the home to the Puritans in the late 1600’s, the Boston Patriots of the 1700’s, the first African American freed slaves community of the late 1800’s, the home of the European Anarchists of the early 1900’s and the location of the 1919 Great Boston Molasses Disaster, when a 50′ tall by 90′ diameter molasses tank collapsed and 2,300,000 gallons came rushing through the neighborhood at 35mph killing 21 people and injuring another 150. The residents of the North End will still tell you that on a really hot day you can still smell molasses in the air. Back in the Revolutionary times it was the home of Paul Revere. The Paul Revere house has the distinction of being Boston’s oldest building, dating back to 1680. In 1770, Paul Revere, then 35 years old, purchased it for 53 pounds, 6 shillings and 8 pence with a mortgage of 160 pounds. It doesn’t seem like much, but in those days it was about 15yrs income. Revere was living at this house when he made his famous ride to Lexington. 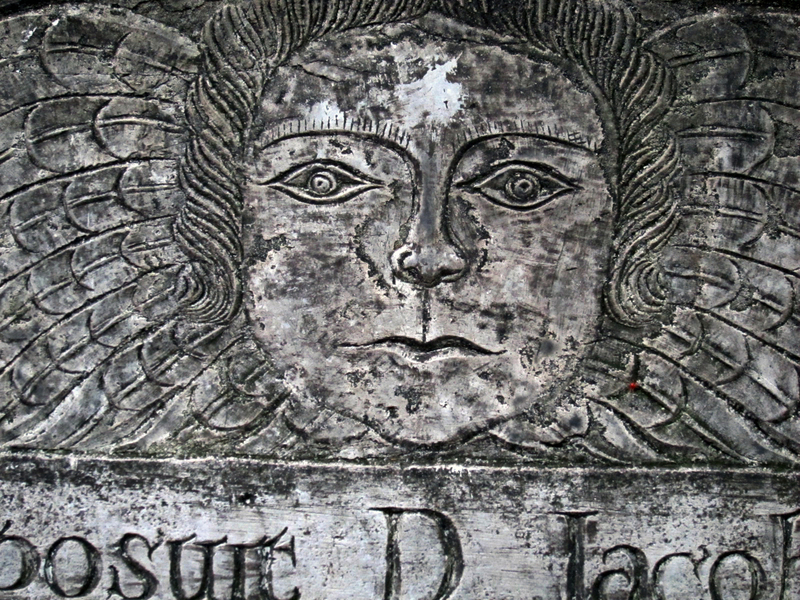 The other great treasure of the North End, besides Mike Pastry Shop on Hanover Street, is the Old North Church. Built in 1723, it’s the oldest church in Boston. The 191ft tall church steeple is where on April 18th, 1775, two lanterns were hung to show that the British were coming across the Charles River. The signal started the battles of Lexington and Concord, the start of the revolution. It’s easy to get around Boston. As I already said, on nice days, it’s a great walking city, but if you’re tired, in a hurry or just don’t feel like walking, this is the home of the Boston MTA, the first subway system in America and the subject of one of the most famous folk songs of the 1960’s about a guy named Charlie who couldn’t get off the subway because he didn’t have enough money to pay the newly initiated “exit fare”. The new fare was a bad idea but the song,written by Bess Lomax Hawes, the sister of American folklorist Alan Lomax, has become such a classic hit that the city has named their transit card the “CharlieCard”. I guess they feel if you keep your CharlieCard filled with money you’ll never have to worry about being stuck on the MTA. When we got too tired from walking, we hopped on the MTA. We took it to Harvard Square where my sunglasses dropped out of my pocket outside the Harvard COOP and an hour later I went back and they were still there. Gretchen told me I should buy a lottery ticket. We rode the MTA to the Boston Museum of Fine Arts, where over 450,000 pieces of art have been on display since 1909. Although the Museum has the best collection of John Singleton Copley, Winslow Homer and John Singer Sargent, (all locals), their works were under wraps, waiting for the new “American Wing” to open. We got there a couple of weeks to soon. Oh well, something to come back for. We also had a great day sailing on Boston Harbor with some good San Francisco friends who moved to Brookline about 3 years ago. 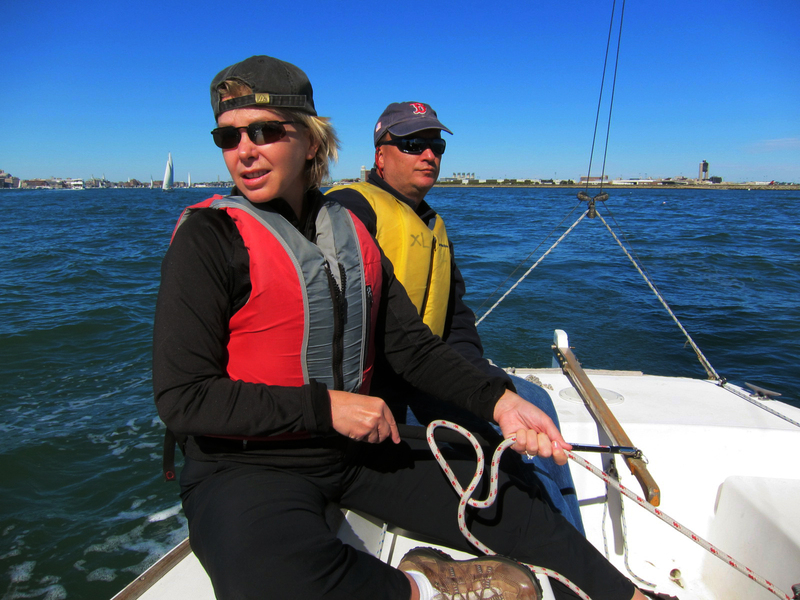 Our friend David Bangsberg developed a passion for sailing and joined the “Courageous Sailing Club, a couple of wharves down from the USS Constitution. It was a beautiful day and a great 3hr tour of Boston Harbor with a picnic break on Spectacle Island, a 105 acre island with great views of Boston, great trails and the dubious distinction of having a large hill created from the excavated dirt from Boston’s “Big Dig” harbor tunnel. We saw the USS Constitution in the distance but never made it over for a visit. There was once a crew of 500 to sail the ship that became known as “Old Ironsides” because during the war of 1812 the British cannonballs would bounce off her hard oak hull. The Constitution saw action from 1798 through the American Civil War. In 1905 she was destined for target practice but a public outcry got Congress to appropriate $100,000 for reparations to save her. In 1907, Old Ironsides became a floating museum and still sails from Boston Harbor 6-7 times a year, these days with a smaller crew of less than 70. We were only here for a few days before heading up north to catch the Autumn colors. 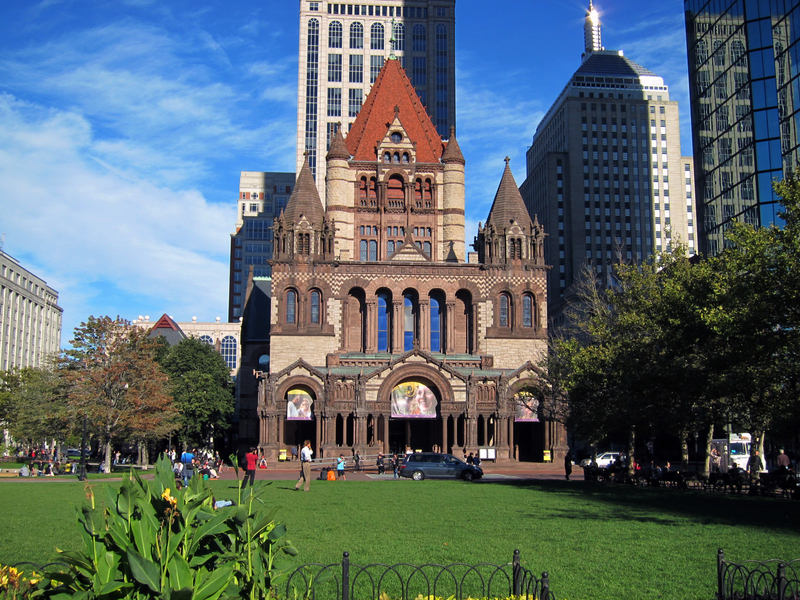 Boston is really a great city, especially if you’re a history nut like we are. Lucky for us there is more to bring us back.